"Turn of the Century Transportation"
In Glacier National Park, it is a treat if you can arrange for a narrated tour of the park in one of the red buses, aka "the jammers". Many in the current fleet of Red Buses have been in service since the mid-1930s. The Red Buses were the first authorized motor transportation utility in any National Park. * The color of the Red Buses comes from the Ripe Mountain Ash Berry in Glacier N.P. * The first transportation in Glacier was by means of four horse coaches of 11 passenger capacity. * The drivers are called “Jammers” because they could be heard “Jamming” the gears of the red buses going up Going-to-the-Sun Road when the buses had standard transmissions. The Red Buses originally cost $5000 each back in 1936. * Of the 33 buses on the road today, 17 are from 1936, 11 are from 1937, 4 are from 1938 and 1 is from 1939. * The Red Buses, on average, transport 60,000 tourist each summer through Glacier N.P. 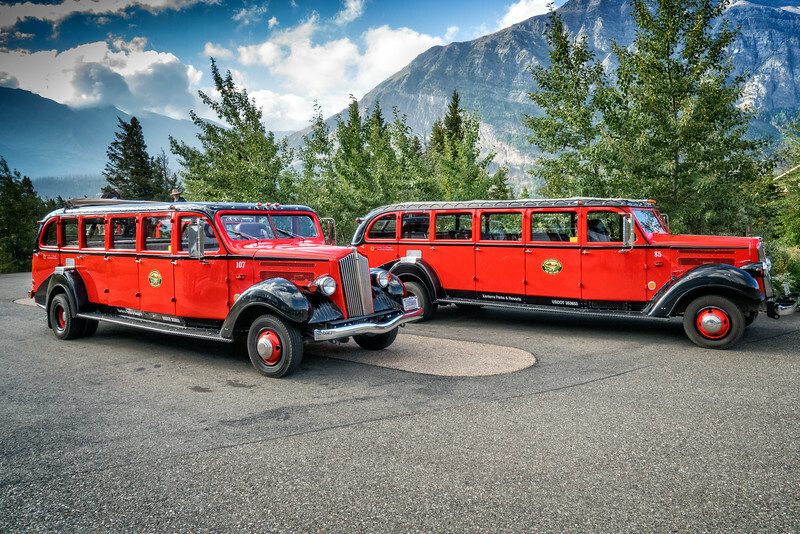 * In addition to touring guests around Glacier, the buses have also served as evacuation vehicles in times of fire or flooding. * Ford Motor Company donated over $6 Million to restore 33 buses to keep them in operation. * Each red bus is estimated to be worth $250,000.